The image of USS LIVERMORE (DD-429) shows her in her post Anti-Kamikaze Mod in the summer of 1945, likely dating in June 1945. You can see the two quad 40-mm mounts aft and the two twin 40-mm mounts amidships that replaced ALL of her torpedo tubes. Also, she has the Mk 28 radar on her Mk 37 director. I wish I knew where this image came from, because I have not located it at NARA or elsewhere. 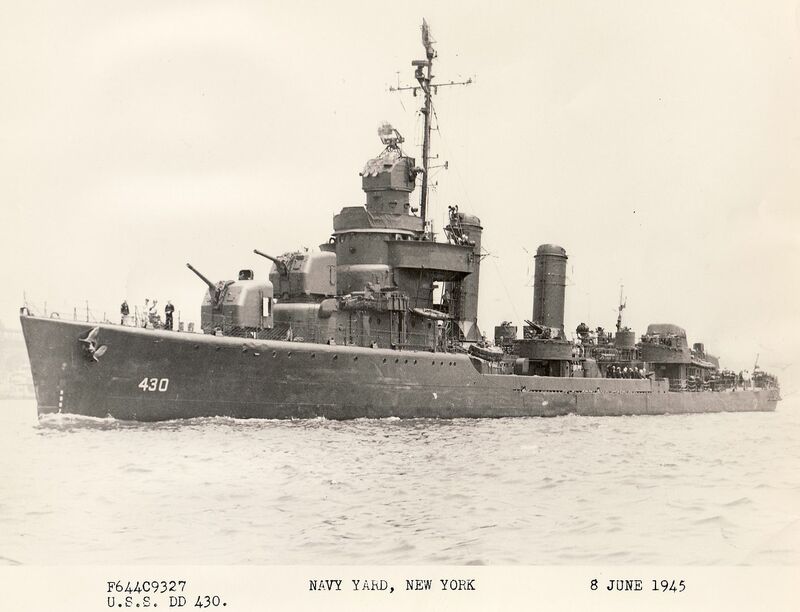 Which is weird because she was modified at NYNY at the same time as her sister in May-June 1945 and post-refit photos of her are available. USS LIVERMORE would have been painted the same as her sister, USS EBERLE (DD-430), Ms 21 because they were both assigned to the odd numbered DesRon 11. Whether she was painted with older 5-N purple-blue or newer #7 5-N Neutral Gray paint can be debated. 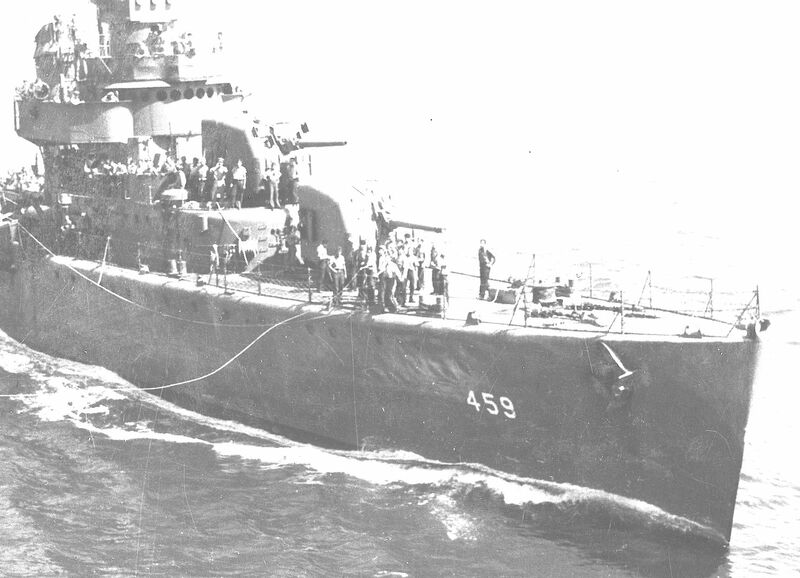 This photo of USS LIVERMORE seems to either have been taken backlit to the sun or is a multiple copy from the original photo when compared to the USS EBERLE image below. I would guess the odds are greater that LIVERMORE and EBERLE are painted in Neutral Gray #7. USS LIVERMORE and her sister were ordered to the Pacific, but didn't reach the war zone until the war was over. DANFS entry; Though she departed New York 22 June, V-J Day found her still training at Pearl Harbor. She reached Japan 27 September escorting transports carrying soldiers of the Army's 98th Division for occupation duty. I am pretty sure the answer is "yes", but want to confirm... Were Laffey's portholes all plated over by November, 1942? Well, at least some were NOT plated over. The exact number and locations can be disputed. Here are a couple of the last images of USS LAFFEY (DD-459) in September 1942, some portholes appear to be open and others could be simply closed with the cover in place or plated over. This image was taken on 16 September 1942. 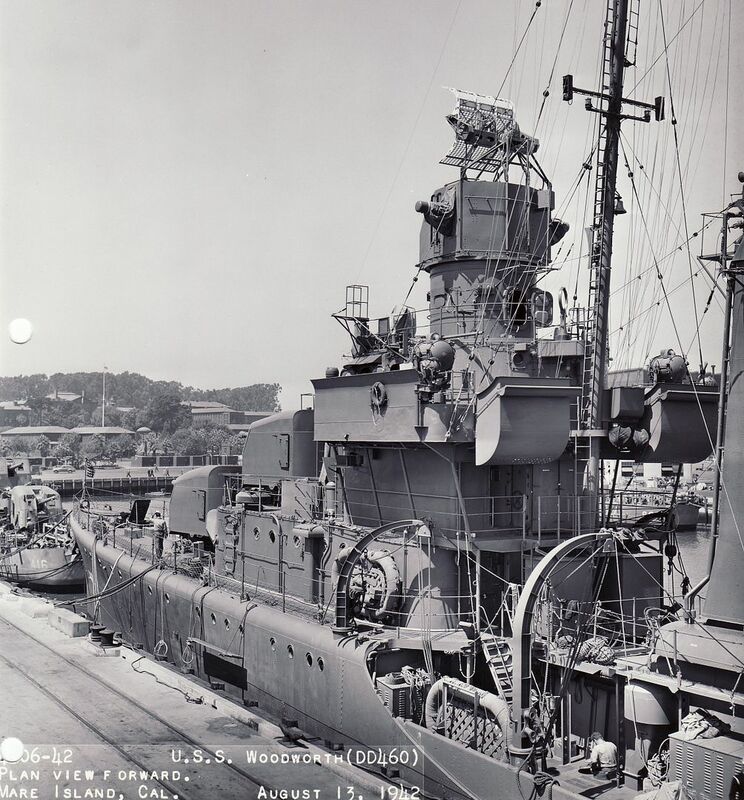 And here is an image of her near identical sister, USS WOODWORTH (DD-460) on 13 August 1942. She still has all of her above the main deck portholes in place.